The database contains audio as well as video file URLs. At run time depending on whether a file is audio file or video file appropriate media player should be displayed to the user. At a time only one media file should be playing from a given list. Next, add a few test records in the database and also make sure that you have the audio / video files in some folder of your web application (say Media folder). 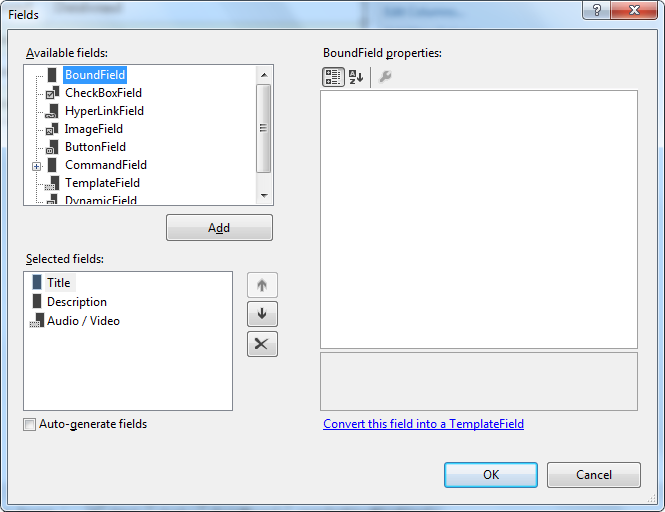 As you can see the Title and Description columns are of type BoundField and Audio / Video column is of type TemplateField. Set the HeaderText and DataField property of Title column to Title. Similarly, set the HeaderText and DataField property of Description column to Description. Switch to the template editor of the Audio / Video column and place a Literal control in the ItemTemplate. Notice the above markup carefully. The AudioVideo table stores links prefixed with "~/". The client browser won't understand this URL unless you convert it into a form that is usable from the client end. This is done with the help of Page.ResolveClientUrl() method. The SelectAll() method simply returns all the records from the AudioVideo table and supplies data to the GridView. Go to the properties of GridView and set the SelectMethod property to SelectAll. This way GridView is bound with the audio/video data returned by the SelectAll() method. The RowDataBound event is raised for all the rows of a GridView including header and footer. We are interested only in the data rows and hence the code first checks the RowType of the current row. Inside the if block you get hold of the Literal control using the FindControl() method. The file extension is then checked. In this example you check only two file extensions - mp3 for audio files and mp4 for video files. However, you can easily perform additional checks here. Depending on the file type HTML5 <audio> or <video> elements are emitted dynamically. Recollect that the Literal control is bound with the Url column and will contain link to the media file. The src attribute of <audio> or <video> tag is set to this Url. Setting the controls attribute of <audio> and <video> displays buttons such as play, pause and volume. Each <audio> and <video> element you emit dynamically need to have a unique ID because you will need to access them from the client side code. This can be done by setting the id attribute to a unique ID generated based on the UniqueID property of the Literal control. Finally, the Text property of the Literal control is set to the <audio> or <video> element markup. This completes the server side coding. You can run the web form and play media files at this stage also. However, you will observe that at a time you can play multiple media files. That means at a time the end user can listen to multiple audio streams unless he pauses / stops the previous file. This might be undesirable. Luckily, you can throw in a little jQuery code and ensure that only one media file is playing at a time. Let's see how to do that. Switch to the markup view of the web form and add a <script> reference to jQuery library (You may need to copy jQuery library into the project or refer it from CDN). The get() method returns the original DOM elements and the returned elements are stored in an array. A for loop iterates through this array and calls the pause() method on individual <audio> or <video> element. This way the audio / video is paused. That's it! You can run the web form and now only the last audio or video you played will run and previously running audios / videos (if any) will be paused.